The Gospel: People NEED Jesus. Daily Spirit and Word 600: The Gospel. Good morning my friends, this is the day we begin to study afresh the Gospel according to Mark. As you know there are four Gospel writers in the Bible: Matthew, Mark, Luke and John. Each gives us quite a unique view of the life, message and purpose of the Lord Jesus Christ. Matthew’s Focus: Audience: for the Jews. Reveals the Messiah who fulfilled OT Prophesy. Luke’s thrust: Audience: Greeks (Gentiles: Non-Jews). Reveals Jesus as The Son of God, Empowered by Holy Spirit who came to Seek and SAVE Sinners. John’s thrust: Audience: For people with a Greek and Roman World View: Jesus is the Creator, Divine Son of God, The Sacrifice who Gives His Life so that mankind may receive Eternal Life. However Mark reveals Jesus as the Servant King: The thrust is on What Jesus did. Main focus of His Gospel (Half of it) The Last three weeks of Jesus life. (Mark wasn’t one of Jesus Apostles: He was a close associate of Peter and Paul.). In the beginning he sets out to declare the Gospel (The Good News) of Jesus Christ. 4 And so John came, baptising in the desert region and preaching a baptism of repentance for the forgiveness of sins. 5 The whole Judean countryside and all the people of Jerusalem went out to him. Confessing their sins, they were baptised by him in the Jordan River. 6 John wore clothing made of camel’s hair, with a leather belt round his waist, and he ate locusts and wild honey. 7 And this was his message: “After me will come one more powerful than I, the thongs of whose sandals I am not worthy to stoop down and untie. “The Gospel” is a phrase that slips off our tongues easily, and we use it so frequently that we rarely stop to think about it’s meaning. Usage of the Phrase: “The Gospel” Not used much by the other Apostles: But Paul and Mark use it regularly in their writings. So what does “The Gospel” mean? First of all it is the Good News of the Coming Kingdom: Proclaimed by John the Baptist, getting people ready. Then it is the Good News of the King of the Kingdom: The Lord Jesus Christ and His mission upon the earth. Then it is the Good News of The Lord Jesus Christ: Died upon the Cross, Risen to Life and Ascended and Reigning in Heaven. So NOW when we think of The Gospel: We always think of it as the Good News of the Lord Jesus Christ: He is the subject and message. He alone is the only way a person can enter into the Kingdom of God. He is God. Whenever I hear the phrase “The Gospel”: I immediately translate it, subconsciously, as “The Good News of Jesus Christ”: But many others don’t think of it that way. For example: When I was going to buy a computer the sales assistant in PC World said, “This is the best deal you’ll get, ‘gospel truth’ and we’ll match any other offer you get”…. The world uses “The Gospel” to associate TRUTH. They know when they hear the word Gospel it means truth. So when we’re out there trying to communicate the Gospel with people and we say I’m out sharing the Gospel, we’d better be clear, because they want to know what we’re telling the truth about. It is the Gospel of Jesus Christ, the Son of God. Although the Gospel is about Jesus Christ, it’s also something that radically meets the needs of all mankind. People Need Peace: People want real peace: Peace from war, Iraq, Syria, Nigeria, Middle East. But peace only ever lasts a short time. There will be wars. However, Jesus gives us a “Peace that the world cannot give”: Peace even in the storms of life. People Need Gladness: Jesus give us gladness. We search the world for gladness and look to it for refreshment; (It does satisfy for a short while, like a McDonald’s burger, a holiday, but after a while, we’re hungry again) but we search for gladness in vain, because the world was not Created to provide it for us. Non-the-less we keep searching, trying, scratching, scraping, hoping, yearning, longing. The gladness or satisfaction we’re looking for can only be found in Jesus Christ, He Created the world, and He alone is the true (gospel) source of gladness and satisfaction in life. People Need Understanding: The world seeks to KNOW: To know the world and the universe: The quest for knowledge is immense, people spend thousands of pounds on their education. However, if they’d but open up the Bible and turn to Mark’s Gospel, and ask God to open their heart they’d find: True (Gospel) Understanding (Enlightenment: When the Light of Christ comes into our hearts, our understanding, knowing is transformened into an experience of the Light of Christ: The Good News, the Gospel). People Need A Strong Will to Live Right: Many people struggle with self-control. Many books are written on the subject. Self-help books litter the shelves of book stores and Amazon pops them up: How to eat well. How to live debt free. How to speak. How to write. How to …. ????? Do a Google search for “an idiot’s guide to”: You’ll find a bewildering and enlightening list of the things that people are really looking for in life: from Science, Quantum Physics, Yoga, Relationships, Marriage, Politics, Debating, Dating, Friends, Management, etc… They’ve even got “The Complete Idiot’s Guide to: The Bible”… LOL. My friends, people want to KNOW HOW to do their LIFE better: Only Jesus Christ can meet all these needs, desires, hungers and wants in life. That’s the Good NEWS of Jesus Christ. Need for Forgiveness: (Not many books on An Idiot’s Guide to Forgiveness). Google search that and you won’t find it. Why? Most people don’t think they NEED forgiveness. There is NO HUNGER or Desire for it. It is not high on the list of most important things in life. Most people don’t think they need to be forgiven by God. They think they are ‘good enough’ deep down, just a little bit wayward. So they don’t think they need the Gospel, the Good News of Jesus Christ. They think they can get along perfectly well without the hindrance of being ‘religious’. Life is just to busy for ‘religion’… “Church: No thank you. I’m NOT religious”. When we were out on Friday sharing the Gospel in Brixton: We got chatting to lots of different people about Jesus. But four ladies that David and I were chatting with stand out for me: It ended with the ladies saying to us; “We’re just out having a good time, so please…” She didn’t say “leave us alone” but that’s what she meant and we got the message. It was a sad way to end a conversation about the LORD. However, people don’t think they NEED Jesus, they’re OK without Him, they’re having a great time without thinking about God. I ended the conversation with; “You know in your hearts you’ve broken God’s Commandments; you’ve admitted that you’ve lied and stolen and lusted, that’s only three of them, so I’m pleading with you, listen to your conscience, and think about what Jesus Christ did on the Cross so that you could be forgiven” They said they would and we left them to have a ‘good time’…. The next man we chatted to, about one minute after the ladies, thought that He was God. We sat down with him and had a very interesting time sharing the message of Jesus. What Hit me more than anything else today: Is this my friends: People NEED the Gospel. 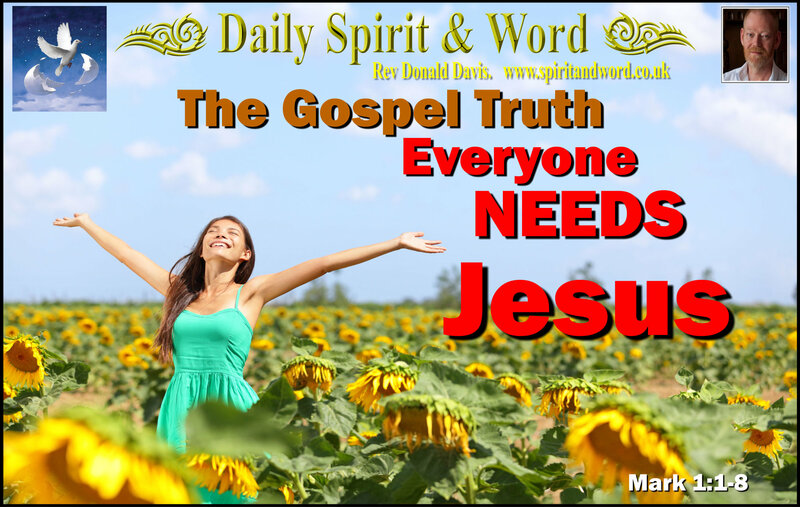 We all NEED the Gospel: The whole Good News of Jesus Christ. We need to HEAR if: Because FAITH COMES BY HEARING THE WORD OF GOD. We also need to RESPOND to it: Just as those who heard John the Baptist responded to his invitation to get ready for the coming Kingdom: They repented and were baptised. RECEIVING: They responded by receiving Jesus Christ into their lives as both Saviour and Lord. GETTING BAPTISED: This was to show the world that they’d been transformed by Jesus and were going to live a new life, in the power of the Holy Spirit and that they were dead to their old ways of living. FOLLOWING JESUS: They then responded by living the Christian life, following the teachings of Jesus Christ, they became His disciples. Most Christian Churches Today: The focus and thrust of good Evangelical, Baptist, Pentecostal and Charismatics is this: Believe, Repent and Receive (with a greater emphesis on the receiving end of the scale). Sadly so few, very few, focus upon the most important aspect, making Disciples (followers who’ll LIVE according to the Teachings of Jesus Christ and God’s Word). They pander to people’s hunger for experience, excitement and fun; but focus little upon the sacrificial life that Jesus has called us to: Taking up our Cross Daily and following / living with Jesus Christ. However, it’s ONLY when we begin to die to self that we can truly know that the Gospel IS the Good News we’ve been longing to hear. Worship: I Surrender ALL to You Lord Jesus. We’re going to see over the coming weeks, as we unpack Mark’s Gospel of Good News of the Servant King: The Lord Jesus did some amazing wonderful things, he had Authority over all aspects of life and even death, you’ll not want to miss any of that teaching I’m sure. Know this today my friends, this Gospel can transform your life today. The Good News of Jesus is for every hungry human soul in this world. They don’t even know they need Jesus, we’ve got to show them their; needs, hungers and desires can only truly be met in the Gospel Good News and Truth of the Person of Jesus Christ: The Son of God who died for them. First: Have you truly responded? Do you Believe, repent, receive and follow Him daily?. Are you following and living according to the teachings of Jesus Christ right this moment? (If you know you are not, then come and receive prayer. Perhaps you need to repent and receive Jesus afresh in your life today). Second: Will you be obedient to Jesus Command: Go into all the world and share the Gospel? Make Disciples? Third: If you have not yet responded to the Gospel, the Good News that Jesus Christ died upon the Cross for you, will you turn and ask His forgiveness for your sins right now? Will you believe that He died upon the Cross for your sins? Will you receive Him as both Saviour and Lord? Will you seek His power and fullness of the Holy Spirit to enable you to live your life for Him? Let us pray: “Dear Lord Jesus Christ, we can see today that we need a much clearer understanding of the whole Gospel message. It’s life and peace and joy and satisfaction can only truly be found in You Lord. Help us to respond as they first followers did, by giving our lives completely to You. Help us Lord and equip us Lord to spread this message that we know people are longing to hear, but don’t know it. Give us the desire to live like You Lord Jesus and LOVE people into Your Kingdom. Amen. I hope you all read and re-read Mark’s Gospel. Have an awesome Sunday and stay close to Jesus Christ. Live in the Power of the Spirit today. Previous PostPrevious God Has Planted ETERNITY into EVERY Human Heart. Next PostNext Why Am I Suffering?